The following is the first in a series of graduate student writings to emerge from the partnership between MEDIA INDIGENA and the #UMNATV Colloquium series. Kicking things off, University of Manitoba Native Studies Masters student Janice Bone shares her reflections following a presentation by journalist Wab Kinew. Wab Kinew (right) speaking at Migizii Agamik at U of M.
A household name who recently defended The Orenda on CBC Radio’s Canada Reads, Wab Kinew needs no introduction. He has been everything from a hip hop artist to Director of Indigenous Inclusion to a father and he brought this all to our #UMNATV colloquium in January of this year. Kinew’s talk, entitled “The 8th Fire: Anishinaabe in Global Context,” played to a full crowd at Migizii Agamik at the University of Manitoba. 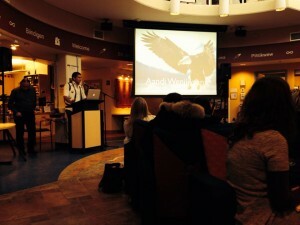 Speaking about his correspondent work with Al Jazeera America — and specifically his run-in with former Secretary of State Donald Rumsfield over those imprisoned at Guatanamo Bay — Kinew’s presentation began with, then wove in and out of, a number of Ojibway words to convey the worldview contained within Indigenous languages. He specifically discussed the phrase “Aandi Wenjiiyaan” (where am I from), elaborating on how working in different countries has made him look at himself, his identity, and his culture. Kinew asked: What does it mean to be Indigenous, and when does this stop and begin? How does someone maintain being Anishinaabe when you’re no longer physically in the area where you are from? For instance, if you are on a plane flying to another people’s lands, when do you stop being Indigenous and start being an immigrant? How does one experience an affinity to Indigenous people when one is in this complicated position? We can turn to language, Kinew argued, to illustrate how we are always making ourselves and our cultures. He identified how linguists utilize the suffix “–win” at the end of words to make nouns into verbs. He also identifies how movements towards pan-Indian struggles — while worthy of critique — can show how political strategies of community-building and identity formation are necessary in certain contexts. He directed the audience to look to critics like Dr. Taiaiake Alfred, who often dissects the usefulness of both perspectives. Kinew stated many social ills within our communities are not solely the result of legal, political, and economic oppression but also emerge out of a spiritual crisis. Turning to the gifts of our ancestors and communities can offer a way of seeing the world in a continual system of relationships, a constantly producing and re-producing spiritual family. Kinew argued that no one needs to lose an identity to participate in a global competitive market because Indigenous cultures are innovative, fluid, and adaptive. Very interesting and provocative article Janice. I’m wondering what you think of the way land operates in explaining/exploring “Aandi Wenjiiyaan – Where I am From.” Does land come with you when you travel? I’m thinking of how my elders tell me to always take my moccasins with me – for these not only ensure that I am comfortable in new spaces but that “home” comes with me; the animals, the land, the beads that were traded her. Further… how might our conceptions of water – a part of the earth which is inherently mobile – challenges our perception of identity while also reminding us of the importance of making claims, finding centres to our identities, and finding footholds for arguments in courtrooms and boardrooms? How do you find this tension in you own work in health? Medicines, for example, come from earth and animal and engage/encounter the sicknesses in a place but how might they also heal those abroad? These all go to illustrate Kinew’s point about mobility and emergence in identity but there are important areas in which one has to settle on a position, even if inherently temporarily, right? Very interesting post Janice. I was especially struck by your discussion of Wab Kinew’s idea of a spiritual crisis. How do you believe Indigenous communities can use spirituality as a means of overcoming the adversity that they face on a daily basis? Do you have any examples of how your community may or may not use spirituality to overcome the difficulties related to hydroelectric development? 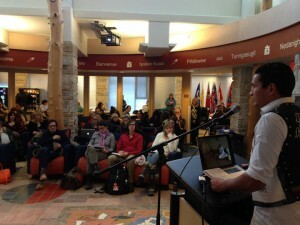 Wab Kinew seemed to also emphasize language in his presentation. Do you think language is integral to the use of spirituality to overcome difficulties faced by communities? What are your thoughts on the use of spirituality to motivate communities into action against oppression? Can spirituality be a catalyst for external change, for example stopping harmful development through direct action, or is it solely for internal change, for example overcoming depression or addiction? Have you noticed any use of spirituality in your field of health as a means of healing? I have heard of spirituality being used by community based groups to help overcome difficulties like addiction, but I was not sure if it is practice in ‘mainstream’ healthcare. Integration of spirituality into Western healthcare seems as though it could have a very beneficial effect, as it may be able to help people feel more calm and relaxed in hospitals and could possible decrease the time it takes to heal from sickness or surgery. urbanized Euro-Canadian and my mother having grown up in the bush as NamegosibiiAnishinaabeqwe. At many times throughout my life this duality has been both confusing and painful. appearance to match my inner mindset. But this was impossible, and the more I wanted to look “Indian” the greater turmoil I felt. 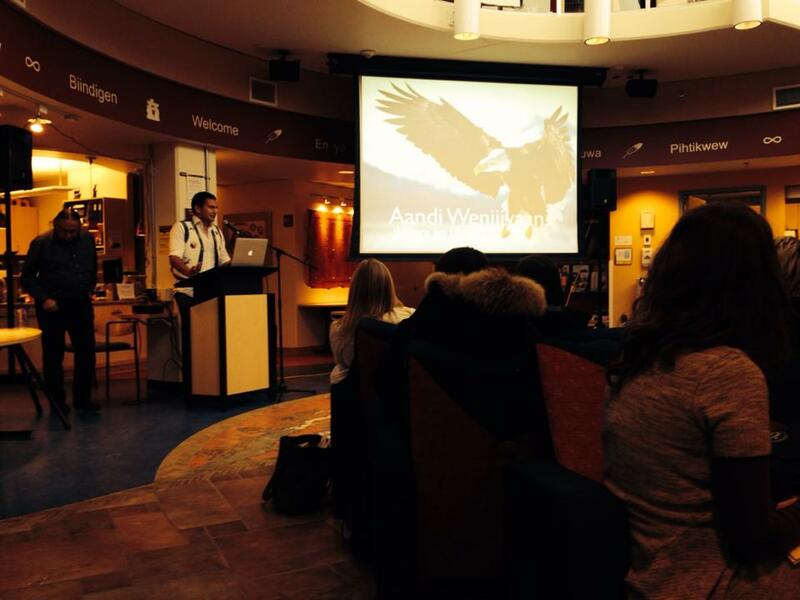 highlighted a recent experience in which he too went unrecognized as indigenous while traveling abroad. To his Arab hosts, Kinew was primarily a journalist from a western country. This was surprising to me given Kinew’s recognizability at home as an Anishinaabe man. Kinew’s talk gave me cause to pause and think more about the importance of self-acceptance. I know Wab is a “household name” in the Indigenous community across Canada (even his presentation was standing room only), but, it surprises me how many non-aboriginal people here in Winnipeg have not even heard of him or the work he has been doing, I.e. – the Eighth Fire series, meanwhile they work in the “Indian industry”.